If life is beginning to seem unmanageable, if you feel a constant sense of dread or experience surges of panic throughout the day then you are likely experiencing a higher than normal level of anxiety. In working together with a therapist at Lucid Psychotherapy & Counselling, you will be able to develop skills and techniques that you can use in your daily life to manage anxiety, as well as begin to make sense of the underlying causes. Through psychotherapy you can begin to experience a greater sense of calm and satisfaction in life that is not diminished by constant worry and anxiety. For many people, anxiety is experienced particularly strongly in social settings and can significantly impact our ability to enjoy friendships and relationships with others. Anxiety can to some extent be a useful motivating force, but too much of it becomes paralysing, overwhelming and can lead to a persistent difficulty in enjoying life and engaging fully in love, work and play. Is there a link between your anxiety and your mood? Some people have high levels of anxiety but are fairly happy people. Their anxiety may even help them in this to an extent. For instance, you may know of somewhat highly strung or anxious people who manage to channel their anxious energy into satisfying work or into performing well. These people may not need any counselling treatment. ​On the other hand, many people find that difficulties with anxiety and with low mood, or even depression, go hand in hand. This is a problem, because many of the more simplistic forms of psychotherapy and counselling that have developed for both depression and anxiety have only been researched to be effective with people who suffer one of these difficulties, or the other, but not both. In fact, it is more common for people to experience difficulties with depression and anxiety together, than as separate issues. Read more about effective counselling for depression that can also address anxiety. If you'd like an example of how depression and anxiety can go hand in hand, think about this: what if you're a person who feels extremely anxious about failure. Having had a set-back in life, such as a low grade, a difficulty at work, or a break up, you might see this as a failure, and get anxious. Having had this recent failure, now when you're faced with a new challenge, you get extremely anxious. The anxiety is so unpleasant, that you learn a way to reduce it. That is to feel and think as if you've already failed. This works to reduce your anxiety, but unfortunately you end up failing repeatedly, because believing you've already failed, you stop trying. This impacts your mood, eventually leading you to feel hopeless and depressed. To get out of this painful trap, you need a treatment that will address both the anxiety and the depression. Should I consider medication as a treatment for anxiety? With anxiety, as well as with depression and other mood disorders, there are significant pros and cons to medications as a form of treatment. 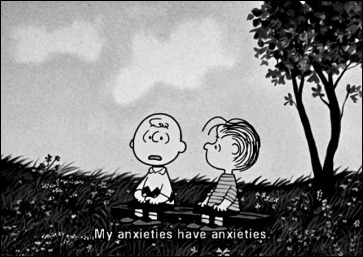 Medications that reduce anxiety are called anxiolytics. Prescriptions anxiolytics include Barbiturates and Benzodiazepines. Non-prescription anxiolytics include drugs as common as alcohol. Self medication (taking these drugs without the supervision of a medical professional) or even taking anxiolytic drugs as prescribed carries risks. Consider counselling as an effective alternative treatment for anxiety, and read more here about pros and cons of using medications for anxiety. Most forms of psychotherapy and counselling for anxiety work in basically the same way. They work by helping us to break the pattern of avoidance or paralysis that has allowed the anxiety to escalate to the point of being a problem. That said, there are a lot of different ways of working with avoidance or paralysis, and it is certainly not as simple as having a counsellor or psychotherapist tell you to go out and face your fears! One way of working with anxiety that we specialise in here at Lucid is through using mindfulness. Mindfulness teaches us to control our mind so that we pay attention and accept (non-judgementally) what is happening in the present moment. When we tolerate the present moment, rather than paying attention to worry thoughts about the future, our anxiety will begin to decrease. Mastering mindfulness skills takes persistence, but we can guide you to help you get the best results. Another way of working with anxiety that we specialise in is a form of psychotherapy and counselling called intensive short term dynamic psychotherapy (ISTDP). ISTDP can help us to access unconscious or shut down feelings or conflicts that we have been avoiding, and therefore feeling anxious about. ISTDP helps us to access our feelings safely, without getting overwhelmed, and then to notice the moment to moment shifts that occur as we begin to feel more, and get anxious less often. This form of therapy may be helpful for you particularly if you're aware that there are particular emotions that tend to make you anxious, such as anger, fear, sadness, or hope.